Jump over here for a full gallery of our pictures from the weekend at Ommegang BCTC 2007. And, jump over here for a recap of Ommegang's BCTC 2006 installment. Saturday morning brought vigor for me (why, I'm still not quite sure) and cobwebs for others. Two travelling companions (Scott and Kathleen...yes, "the Blonde"!) and I made our way to into town for a quick Hall of Fame tour. So happy I was to do this, since it has been almost twenty years since I've last been to the HOF. The town is all dressed up and ready for this year's inductions during the last week of July. They play such a great host. If you haven't been to the lovely village (yes, I said lovely!) of Cooperstown, make plans to do so. For as much of a baseball industry town that it is, Cooperstown has so much more going on to provide enjoyment for even the non-baseball traveller. We arrived back to the brewery just in time to get ready for the afternoon session of tasting Belgian-style beers from over 50 Belgian and American breweries. Here presented me with my second (mild) criticism of the event. My plan was to check-in for the event and get my tasting glass and event directory/map/menu. Lo and behold, no such document existed. Last year's menu was so, so, so valuable to me....for three reasons. First, it allowed me the ability to plan my hit list of breweries and beers that I wanted to try during the event. Second, it provided me with a pre-printed (and heaven help me, legible) list of all breweries and beers in attendance. All I needed to do was make shorthand notes....stars, sequential numbering, and other notes to remind me later of favorites and other opinions. Last, it served as a reference point during the following year and even in the week leading up to this year's event. It made recalling and writing about the event down the road so much easier. My plan was to take this menu back to the campsite and review it for 15 minutes planning out my approach to visiting the different breweries and tasting the beers. Now this set me back. What should I do? Should I go full geek with my notepad and pen, furiously scribbling notes hoping that I'll later be able to read them? Should I take along a recorder and speak into it and replay it later to transcribe? Should I get over it and just enjoy the event? I chose the latter. Though, now I'll tell ya, it ain't easy dredging up 4 hours of memories of actual beer names, the breweries that were there, and rankings of my personal favorites. So, what follows is a loose interpretation of my memory of beers that stuck out. I've alphabetized them by brewery name so as not to imply favorites. - Man, these guys have changed for the better since I was last there 4 years ago. Their whole lineup was great (El Rojo Diablo, Raspberry Wheat, and Unique as well)...were they the ones also pouring the Black & Blue (or something to that effect?) Don't know there wasn't a "menu"
- Anything they brought was simply beautiful. They win my award for best overall lineup at the event. I've written about a visit to their place in the past, and seeing Will Meyers (above) reminds me to tell you again.....get there to Boston, er Cambridge, and pay them a visit! - I didn't sample anything new from DFH this year and I'm not over-the-top crazy about the Festina Pêche, though it is a better-than-average beer. But, what DFH does win this year is best presentation and most hype around a particular beer. Sure, there was the Pannepot vs. Pannepot (is that kind of like Spy vs. Spy?!) but DFH is in a class of its own. Somewhere around 4pm or so, they rigged up the Randall full of peaches and ran the Festina Pêche through it, then served it in a glass with a fresh peach sliver. All throughout the tasting tent you could hear the chants of "...peach, peach, peach..." and "...randall, randall, randall..." and various other unprintable things! The crew at the DFH table was a new batch from last year (where have you gone Matt Webster?). Crazy kids, I tell ya! - This had to be one of the most intriguing beers of the day. Did I taste lavender...cardomom? Could be. Other spicy and piney notes were noticeable too. It was a dark beer of medium weight and a delicate flowery taste that came and went without being overwhelming. - Now, could someone please, please help me here? After an afternoon of drinking beers ranging from dubbels, to tripels, to quads, to strong ales, to Belgian-inspired hoppy beers, to Flemish sours, and on and on and on, I came across two different Belgian Pilsners. Either my palate was just ready for something different, or these were both flippin' awesome. (Probably both) If I could only remember who made them? A little help anyone....please? I'm looking at the event t-shirt (sort of like a concert t-shirt, no?) and it's still not helping....Bel Pils? Floreffe? Boy, I wish I had an official checklist instead of a t-shirt. 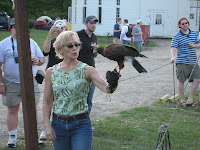 All during the course of the 4 hour tasting event, horses, falconry, Leo's Belgian waffles, burgers, brats, music, etc. kept the crowd well-fed and well-entertained. My favorite music of the day started with the rockin' Newspaper Joe Blues Band (left) and finished with the late night Mecca Bodega. This year's absolutely perfect weather allowed the horses to be out and about, as well as the falcons. Plus, for the kiddie set, their were carriage rides being given around the property. 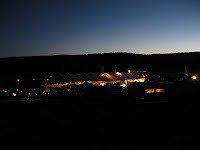 As night fell over the property, the music turned from folk/rock into the percussion grooves of drums and bass. Into the wee hours, the music raged, the fires burned, and the super-awesome beer karma spread as folks went from one campsite to another sampling left over commercial beers and homebrew alike. Sunday morning wasn't as kind to me as Saturday morning was. It took until about half way home on Sunday before the cobwebs were completely gone. Two of the three more memorable comments that I overheard came on Saturday morning. Let's see, one went something like "Those aren't pillows!". Another one, "f no! ", was a reply at 9am to the question "Would you like some Avery Mephistopheles for breakfast?" The third was suggested to me as a wrapup on his feelings of the event on the final day as folks were leaving: "Do I think they still have some kinks to iron out and will continue to work to make this an even better event? Sure. Will I be back next year? Abso-effin'-lutely." Click here for a review of Day 1 of the Ommegang BCTC 2007 event. "Would you like some Avery Mephistopheles for breakfast?" I believe I had some of the Mephistopheles that Bryan was kind enough to share with me at about 8 or 9 am Saturday morning outside our camp site. What a way to start the morning. Ha! We were camped right next to the Stewarts crew, too. Such a nice group and I really loved their beers. I was embarrassed that I had never heard of it, but now we have even more of a reason to take a road trip to Delaware sometime soon. Here's a link to my BCTC from the last 3 years. See if you remember seeing us! Wow, great pix Craig. Of course I remember you now! That's awesome that you got a pic of the Benz from Canada with the taps running off the back ends of the car. I was walking around early Sat. morning when they pulled up. Do you know if they were they the Unibruoue guys? I don't know who the taps car guy was. But I was right there when he pulled up, too. I took the photo later when I thought he wasn't looking, although I'm sure he's used to it. Do you have any photos of BCTC? I found your photos. Now I remember!